Description: CSX ES40DC 5203 leads Q282 (Baldwin Fl. to Louisville Ky.) through Glendale. Description: CSX 5203 leads CSX Q190-10 east off the Morrisville Line. Description: "Chessie" power eastbound through Abrams Yard. 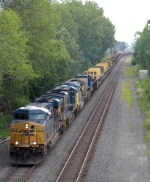 Description: CSX stacks eastbound at CP KALB. Description: Special thanks for Allen Green & Cullen Reid for the heads up! Description: Special thanks to Allen Green & Cullen Reid for the heads up! Description: CSX ES40DC 5203 leads Q525 (Louisville Ky. to Nashville Tn.) through Glendale. CSX 4541 is trailing. Description: Eastbound across the ex Pennsy high line by Franklin Field. Description: Q133 south at Worthville. Description: Eastbound CSX train Q410 wirh 881 leading waits on number 2 track at Rossville as westbound CSX 5203 and train come off the single main track and pass on number 1 track. Description: Q032 heads east at 1137. Description: It's 9:02 AM as westbound CSX train Q033 with 5496 leading starts in on number 2 track at Rossville interlocking, Philadelphia Subdivision. Description: Triple ES40DCs lead Q034-01 slowly east on the slightly lower main. Description: A YN3 quintet guides Q301 through Zoo at 0855.